Frost, the horse that Sibbi Black-Briar "gifted" to Louis Letrush. Lydia and I were adventuring in southeastern Skyrim a few days ago when we met a man named Stalleo. He and a few weapon-clad men were hovering around a fort – Treva’s Watch. We listened to his story as he told us how bandits ransacked him and his family and took over Treva’s Watch. His family was still inside and even though I presumed they were already dead, we ventured inside regardless. We battled many bandits and came across much valuable loot but we never found Stalleo’s family. After clearing the fort of bandits we let Stalleo know that we found neither hide nor hair of his family. Afterwards we travelled back to Riften and I informed Alessandra that I delivered her father’s dagger to Andurs in Whiterun. While in Riften I also took care of a few other things, on my own. Firstly I lent a hand to a redguard named Shadr. I overheard him getting hounded by this woman named Sapphire. After they had finished, I approached Shadr and asked what was wrong. He works at the Riften Stables and had gotten involved in some sort of shakedown. Sapphire asked him to purchase some equine related gear and on his way back to town, thieves pilfered his goods. Because Sapphire loaned him the money for the goods, she requested her payment, even though Shadr couldn’t pay. Shadr said he was weary of this transaction in the first place but undertook it nonetheless. After a quick chat with Sapphire, I was able to remedy the situation. I just hope Shadr will remember that if something seems too good to be true, it probably is. Looking for a place to stay the night, I met up with Lydia at Haelga’s Bunkhouse, figuring we could get a room. Unfortunately, Haelga would only sell rooms to “hardworking merchants”; however while there I had a conversation with Haelga’s niece, Svana Far-Shield. She was very open with me and discussed her disdain for her aunt. She also told me Haelga sleeps with many men and afterwards gives them a Mark of Dibella. Svana thought it’d bruise Haelga’s pride if I found a few of these and returned them to Haelga. Svana knew of three men in town who had them – Indaryn, manager of the Black-Briar Meadery, Hofgrir Horse-Crusher, owner of the Riften Stables, and Bolli, a worker at the Riften Fishery. It was easy to persuade these gentlemen that it’d be best if I had the Marks and when I presented them to Haelga, she had a change of attitude. Before finally settling down for the night at The Bee and the Barb, I had a conversation with Louis Letrush. He told me that Sibbi Black-Briar (in jail) owed him a horse and now was a good time for Louis’ payment. The following day I visited Sibbi in jail to gather information on the horse’s whereabouts. 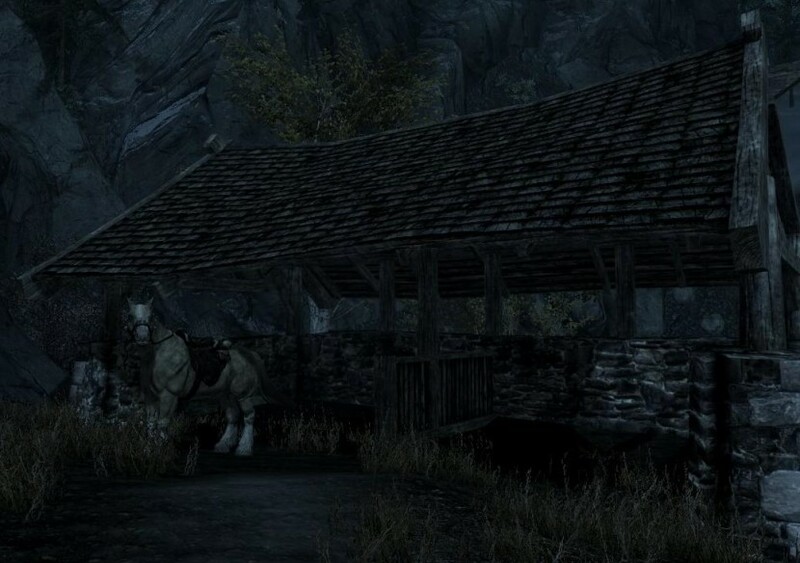 The horse was located east of Riften at the Black Briar Lodge, a getaway for the infamous family. He warned me that there was an ample force of mercenaries and retrieving the deed would require stealth. Sure enough, when Lydia and I made it, we killed a few relentless mercenaries and snuck into the lodge. It didn’t take long to find the deed and we quietly exited. Once outside, we located the horse and met Louis in a secluded location. He was thrilled to have the horse and paid us very handsomely.